What if I told you that an ancient Chinese practice could help treat the symptoms of a disease that doesn’t have a known cure? All it takes is the simple breathing, meditation, and movement techniques associated with qigong to manage the frustrating symptoms of fibromyalgia. Many consider fibromyalgia to be mysterious because it mimics other diseases with similar symptoms. Its most common symptoms are chronic fatigue, headaches, insomnia, or joint pain. Conditions such as arthritis, osteoarthritis, and Lyme disease must be ruled out. Qigong is mysterious as well. It is a mind-body exercise that can move energy throughout the body. It involves your complete attention and mental focus. 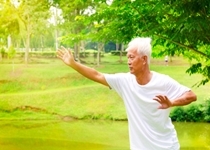 How can qigong benefit your fibromyalgia symptoms? It actually doesn’t take too long to see results. In a qualitative analysis of a controlled trial published earlier this year in the Journal of Alternative and Complementary Medicine, researchers from Dalhousie University in Halifax, Canada found that Chaoyi Fanhuan qigong (CFQ) favorably improved the symptoms of fibromyalgia after only eight weeks of 45-minute daily sessions. There were 73 people who completed the randomized controlled trial, and they continued to report benefits four and six months later. Instruction included seven slow and rhythmic movements. From that group, 20 people participated in an extended trial with further level-two qigong instruction, which consisted of meditation techniques, such as sitting, standing, and lying. The extension trial also received two four-hour training sessions from a certified instructor. Participants then practiced 60-minute sessions of qigong for eight weeks, followed by an additional four months of practice. That’s not the only study I found. The researchers at Dalhousie published another study in the journal Arthritis Research & Therapy in 2012. This randomized controlled trial also indicated the long-term benefits of Chaoyi Fanhuan qigong for fibromyalgia. The study observed 100 participants, which were randomly assigned to a delayed or immediate qigong practice group. At the end of the control period, the delayed group received qigong training. The qigong training was three half-days. There were also eight weeks of weekly practice sessions and a 45- to 60-minute home session during this time. Both groups showed improvements in sleep, pain, impact, and mental and physical function when compared to the waitlist and usual care group. Observations were recorded at eight weeks, four months, and six months. Fibromyalgia is known to affect more than 12 million Americans, but there is much more you can do to naturally combat this annoying disease besides qigong. Other activities and exercises known to benefit fibromyalgia include yoga, massage, acupuncture, manual lymph drainage therapy, and another ancient practice from China, tai chi. Homeopathic remedies including rhus toxicodendron, bryonia, and causticum are also considered an effective remedy to treat common fibromyalgia symptoms. Sawynok, J., et al., “Qualitative analysis of a controlled trial of qigong for fibromyalgia: advancing understanding of an emerging health practice,” Journal of Alternative and Complementary Medicine August 2014; 20(8): 606–617, doi: 10.1089/acm.2013.0348. Sawynok, J., et al., “Extension Trial of QiGong for Fibromyalgia: A Quantitative and Qualitative Study,” Evidence-Based Complementary and Alternative Medicine August 28, 2013; 2013: 726062, doi: 10.1155/2013/726062. Lynch, M., et al., “A randomized controlled trial of qigong for fibromyalgia,” Arthritis Research & Therapy August 3, 2012; 14(4): R178, doi: 10.1186/ar3931. “What Is Fibromyalgia?” WebMD web site; http://www.webmd.com/fibromyalgia/guide/what-is-fibromyalgia, last accessed October 15, 2014.